Please donate new, unused household cleaning supplies. Collection boxes Monday, April 9th- Friday, April 13th. Spring Cleaning Supplies Collection benefitting the Pasadena Ronald McDonald House Monday, April 9th- Friday, April 13th. Please donate new, unused household cleaning supplies. Collection boxes at student drop off. 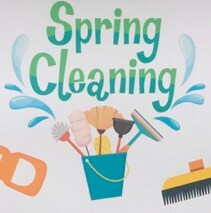 Suggested items: disinfecting wipes, spray cleaners for windows, bathrooms and kitchens, floor cleaner, furniture polish, laundry detergent, dryer sheets, dishwashing liquid and detergent, liquid hand soap (no bar soap please), disposable gloves, sponges. Questions? Please contact Valentine PTA Community Outreach co-chairs Claudia Boles crosspoly@aol.com or Maggie Mar maggie_mar@hotmail.com.